You can't get much healthier than this! A homemade fresh salsa, low-fat and high-protein chicken breasts, delicious quinoa, and high-fiber black beans. All in one beautiful and convenient bowl! The chicken prepared in the pressure cooker, with the whole meal ready to enjoy in under an hour. Be sure to offer a variety of your family’s favorite toppings and let everyone customize their own bowls. 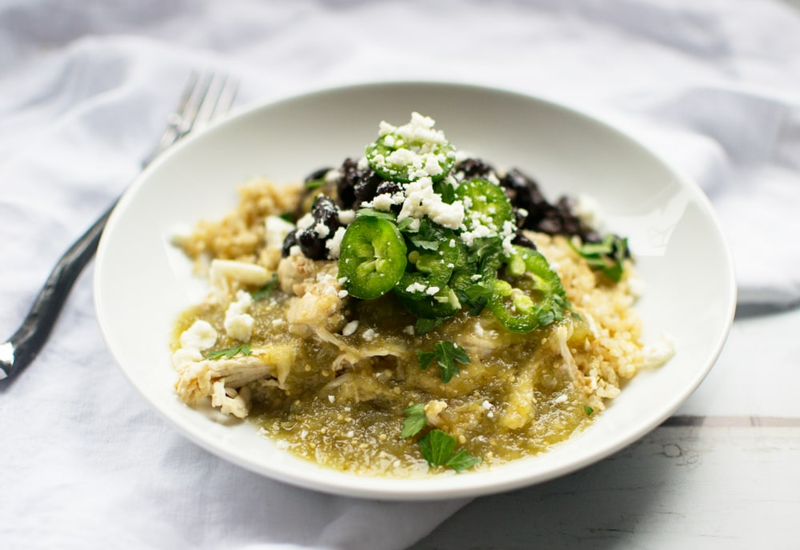 Consider sliced fresh jalapeño pepper, crumbled cotija cheese, or chopped fresh cilantro. Arrange tomatillos and jalapeño pepper on a baking sheet. Cook under hot broiler, turning once, until lightly blackened, about 5 minutes per side. Combine onion, cilantro, lime juice, and salt in a blender until smooth; add tomatillos and peppers and pulse until smooth. Arrange chicken breasts in the bottom of the pressure cooker pot. Pour salsa verde mixture over the chicken. Stir water and quinoa together in a 1-quart stainless steel bowl that will fit into the cooker. Lay steamer rack onto chicken and sauce. Place bowl onto rack. Seal lid on pressure cooker and turn steam vent to Sealing. Press Pressure Cook button and use the “+” and “-” buttons to adjust cook time to 20 minutes. Immediately turn steam vent to Venting to Quick Release pressure. Remove quinoa bowl and rack. Shred chicken into the sauce in the pot using two forks; stir to coat. 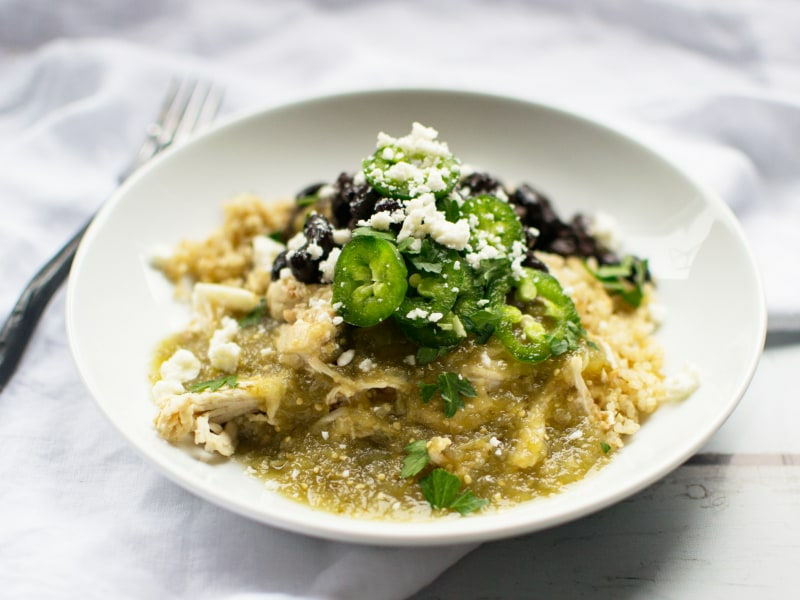 Divide quinoa, shredded chicken, black beans, jalapeno, cotija, and cilantro equally between bowls. Spoon extra salsa verde over quinoa to serve. Even though they may look similar, tomatillos are not just green tomatoes! Tomatillos are not a type of tomato at all. In fact, they are actually related to the gooseberry. Which makes sense since they are covered with papery husks. Per Serving: 1411 calories; 14g fat; 186.0g carbohydrates; 137g protein; 195mg cholesterol; 2643mg sodium. Delicious! I made this recipe in my pressure cooker the other night and it was so good. The salsa verde was fantastic, roasting the tomatillos makes a huge difference. I used chicken thighs instead of breasts because that's what I had on hand, and it worked out perfectly. I normally would just dump a jar of salsa verde into the pot with some chicken and simmer it a little bit, but I got some tomatillos in my produce box & thought this would be even better. It was! I love tomatillos & now feel guilty for being lazy about salsa verde beforehand. This was super-easy and almost perfect. I like jalapeno fine, but may add a serrano to get a little more heat in mine next time. Made this recipe using pork instead of chicken and topped it with Mexican cheese crumbles and sour cream. This recipe is so delicious and really versatile, I’m thinking about doing tacos next time. So grateful for the clarification between tomatillos and green tomatoes! I probably would have bought the wrong ingredient. I used pinto beans instead of black beans, and topped my bowl with lots of cheese and sour cream too. I did shredded beef instead of chicken and it was phenomenal. I followed the barbados beef recipe and then put the bowl together when it was done. This will definitely be in the rotation now! Easy and VERY tasty! Also very good for you! I like their versatility, also.